Whether performing as one half of the dream-pop duo Azure Ray, a member of Art in Manila, or as a solo artist, Orenda Fink has always been gifted at enticing her audience to come along on her personal journeys. The Omaha-via-Athens musician’s newest record Blue Dream is no exception. Written following a year of self-exploration and Jungian dream therapy in which her views on life, death, and the afterlife were challenged, Blue Dream is a dreamy testament to the human condition. Below, Fink opens up about being vulnerable on stage, forging ahead in a male-dominated industry, and what losing her dog of sixteen years taught her. Congratulations on the new album! What was your journey to this record? Well, about two years ago my dog died. I’d had him for sixteen years. Essentially, it kind of sent me off into part depression, part existential crisis, part just awakening. I felt like I’d kind of been running on this autopilot for the last fifteen years of my life and it just brought everything to a halt. I started seeing a psychotherapist that my friend had recommended and she happened to specialize in Jungian dream analysis. At the time I started with the therapist, I started having dreams, and they came really like a flood as soon as I started seeing her. They healed my grief and they changed how I felt about the nature of life and death and the afterlife. And when I kind of came out on the other side of them, that’s when I started writing again. I didn’t write for a year. And I wasn’t even writing about that, necessarily. I just started writing again and that experience was filtered into my inspiration. These songs come from such a personal and emotional space-- what has it been like to share them with an audience? The first time I played “Poor Little Bear,” which is the only song on the record that is just directly for Wilson, I played that at the Saddle Creek Shop. They were having a special event there, and I literally started crying while I was playing it, and I looked out and there were like five people crying, too. That was a really emotional experience and I get off the stage and my friends are hugging me and crying, because they know me and they know what that song means and what I had gone through. So it went from that super emotional first time to now, [where] I feel like I’m a little more stable with it. I was scared at first that people were going to make fun of the idea, that it would be too out there, you know what I mean? And so far, the response has been so positive! I think that’s because we all feel the same things. We basically have the same fears and thoughts and feelings and wanting to know what the meaning of our life is, and what happens when we die, and why are we here. Sometimes when it is very personal, it touches people in a more universal way. Could you talk a little bit about the recording process? What was that like? It took about a month off and on and the process was that Bill Rieflin, who played drums, who was in Ministry which I think is so funny (laughs), he flew in and stayed for a few days and basically just put the drums down. He was doing the songs for the first time and it was interesting because I think he was thinking that they were pop songs and not really focusing on the lyrical content. And I would say, “This is too poppy, this song’s really sad,” and he was like, “Yeah, it should be poppy because the song is so sad.” (laughs) I was like, “Okay!” He really kind of informed the record in a way that if he hadn’t been there, it probably would be a different record. So he laid down the drums, and then me and Ben Brodin and my husband Todd [Fink] just kind of started filling in the blanks. We were all like little machines working around the clock to make it sound like a dream. I was like, “No, it doesn’t sound dreamy enough, keep going.” It was kind of one of those whirlwind processes where, looking back, it just feels like a blur. The album art is so cool. Is that a narwhal? Yeah. I was trying to conceptualize art for the record, I asked for a friend’s advice and he said that he thought of a narwhal, and I was like, “Hmm.” I wouldn’t have picked that, necessarily, based off of my experience with the record. But right after he said that, I started seeing narwhals everywhere. Paintings on the walls of art galleries, and the book I was reading was talking about a narwhal, and I got an email from the BBC with an article about narwhals, and it was within three days that I was like, “Okay, it’s going to be a narwhal.” (laughs) And then the teeth on the side are from a dream of mine where I was rescued from the bottom of the sea by a string of teeth. Maria Reichstadt is the artist, she’s amazing. Are you a feminist? What role has feminism played in your life? Yes, I proudly call myself a feminist. I think the role it’s played in my life is that it’s allowed me to have a sense of self-worth that’s not damaged or dictated by a patriarchal society. In an industry dominated by men, it instills in me a confidence that allows me to just forge ahead and feel like an equal to my peers. And within that, I know it’s my responsibility to work hard and be great at what I do and to be a peer. But I feel like it’s served me as far as just creating a framework to my professional life that’s unencumbered by sexism. Do you feel like you’ve experienced sexism in the music industry? Or is that something you’ve mostly been able to ignore and forge ahead? It sounds like you and Wilson had a really strong connection. Do you feel like there’s anything he taught you? Oh, yeah. He taught me a lot. When I got Wilson as a puppy when I was a twenty-one year-old in Athens, Georgia, I didn’t imagine that I would have him for sixteen years. You see the whole cycle of life with a dog, and it’s a strange thing. It feels like it’s your child, but you don’t usually have a child for sixteen years and watch them become like 80, 90 years old and kind of are a hospice care worker for them at the end and then ultimately have to put them to sleep. One thing he definitely taught me is that you’re only as old as you think you are. Because he never seemed old, except his body seemed old. And that was, I think, the hardest part in losing him, because I just didn’t want him to die and he didn’t want to die. But the other thing he taught me is that you can have a connection with an animal that is just as powerful as a person. There’s things about animals, that-- I guess it’s just because they love you so unconditionally. It’s something that you don’t get anywhere else so it creates a space in your heart. I guess maybe that’s why it’s so devastating when you lose them. It’s a special, innocent type of love. In my dreams that I had, Wilson was in a lot of them. I like to think of him as a dream messenger. And I feel like he almost did more for me after his death than he did the whole sixteen years I had him. At the end of the dream cycle I just said thank you to him. It was almost like he still wouldn’t leave my side, even in death, until he knew I was okay, and then he could finally go. Blue Dream is out NOW on Saddle Creek Records and is available on iTunes. Orenda Fink will be touring the US this fall. 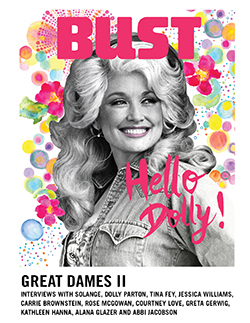 Pick up the August/September issue of BUST to read our review of Blue Dream! LIZ GALVAO is the Music Editor at BUST Magazine. Her writing focuses on humor, feminism, and pop culture.